While the whole 'Blogger' format has served me well over the last couple of years, it just wasn't working out over at SD. I mean, if you create a new post every week like we do here on the B Side (which will stay just the way it is - don't worry), Blogger lists like the last five entries on your 'start page' and archives the rest. A brilliant idea. If you were, however, to keep on adding information to the same posts over the course of several months (like we do on soul detective), the format just doesn't make sense. Before long, the site begins to collapse under its own weight, as the start page takes just short of FOREVER to load. This had become the fate of ol' soul detective. Well, hopefully, all that's changed. I had registered the URL souldetective.com a while back, and just recently had this brainstorm... what if I were to use it as a 'front page' that provided links to all the individual cases? That way, even though they'd still be hosted by Blogger, the same as they ever were, they would each load individually and not gum up the works trying to do everything all at once... I don't want to bore you with all of this, but it does appear to be working. 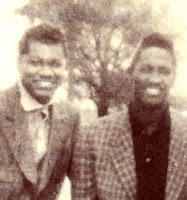 A glance at the BMI database revealed that the L. Crume listed as the co-writer of this funky, incredible tune we have here today, is none other than LeRoy Crume, the man hand-picked by Sam Cooke to replace Bob King as the Soul Stirrers' guitarist in 1956. This unbelievable YouTube video shows Crume in action, and offers a glimpse of what an important figure he was in the development of the jumpin' electric guitar. Anyway, I'm guessing LeRoy is the 'Lee' listed on the label. 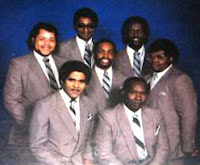 OK... BMI lists the other songwriter as Calvin April, long-time lead vocalist for Gospel quartet The Pilgrim Wonders... 'Calvin'. Now how about that? 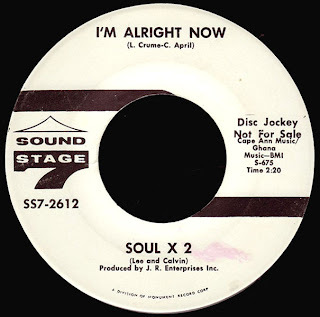 The catalogue number of the single places it in the summer of 1968, shortly after Sam & Dave broke into the top five with I Thank You, and while James & Bobby Purify were still cracking the R&B top forty. I have no idea who brought these two together in that same kind of mold, but it sure works for me! What a great record, huh? 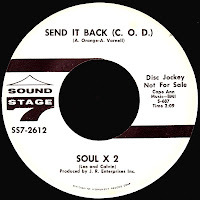 Also, if you've been paying attention lately, you might recall that John R was producing Sound Stage 7's 1968 releases almost exclusively at American Studio in Memphis, using the 'house band' - a band that, by then, included not only our man Reggie Young, but yet another product of the Chicago Gospel world, Bobby Womack on the guitars. Wow. This is the kind of stuff we do over at soul detective. Come join us. 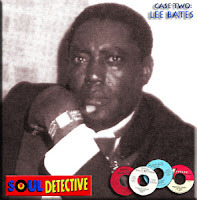 Great site - wonderfull detective work - and this is a really haunting slice of soul - love that intro. Cool! I enjoyed Soul Detective until it starting locking up the ol' Mac every time I tried to open the page. I just checked out the new site and it works fine for me now. Thanks! I happened by your wonderful site looking for more information on this same duo, but for different material. shortly after this recording they signed with Stax/Volt and recorded under the name Branding Iron. I've only chased down 2 tracks. Every song is so damn good. Thanks so much for the kind words about the site! ...got three of them myself, so far. Look for them soon in an upcoming post.